Enjoy your time at the beach with luxurious furnishings, appliances and amenities to make your Ocean City vacation a forever memory. This home is very well maintained. Every effort is made to ensure it's excellent condition. The home has a private side entrance as well as 4 large decks with ocean views. They provide quiet locations to sunbathe or just relax with your favorite beverage while watching the sunset with sparkling views of the Ferris Wheel and amusement rides 3 short blocks away. The home is equipped with a private elevator that is accessible from the garage to the third floor, ensuring no need to carry suitcases or groceries. (The property is not wheelchair accessible as it does have steps) The two story floor plan includes a large family room, Kitchen, full bathroom and 4 bedrooms on the second floor, all with queen size beds with two of them having their own private bathroom. The third floor is spacious and includes one queen size bed and a set of twin beds as well as its own private bathroom. Two decks on this floor enjoy excellent views of the Ferris Wheel and ocean. On the ground level is another full bathroom with direct access from the street for easy clean up after a day at the beach. The unit is also equipped with two full size washers and dryers located in the garage and on the second floor. All bed rooms include flat screen HDTV's and DVD players. Wireless internet access is also available throughout. There exists no need to bring a pack-N-play as one is available. This unit has a convenient location which allows you to park the car and leave it parked for the whole week. Three blocks to Wonderland rides, two blocks to free shuffleboard, running track, tennis and basketball courts. Oves Family Restaurant at the end of 4Th Street offers beachside food and bike rentals. The location is only five blocks to the Music Pier or movie theaters and eight blocks to Asbury Ave. with its shopping and dining. If interested in off season packages please contact us. We require a three night minimum stay. - Great Northend location - less than 500 feet to the beach and a short walk to food and rides. Park the car for the week. Thanks for taking the time to visit this website! Less than 500 feet to a great, life guard protected beach. (2) 2 full size - use the one in the garage for towels. 50" HDTV in family room, 42" in 3rd floor master suite, 26" in all other bedrooms. Includes HBO in two rooms. What a beautiful house and communicating with the owner couldn't be easier. Wonderful experience! What a beautiful house in beautiful Ocean City. We come here as often as we can for some R and R. The house is very clean and spacious. The owners are very prompt with answers from any questions you may have from either phone calls or e-mails. I would highly recommend this vaction house for any occasion. Nothing but good times and lasting memories. We just stayed at this lovely clean house. It was a very enjoyable stay as it provided 8 women with five bedrooms and 5 baths. The elevator convenience to the 2nd and 3rd floors was a terrific way to get luggage and groceries in an out. 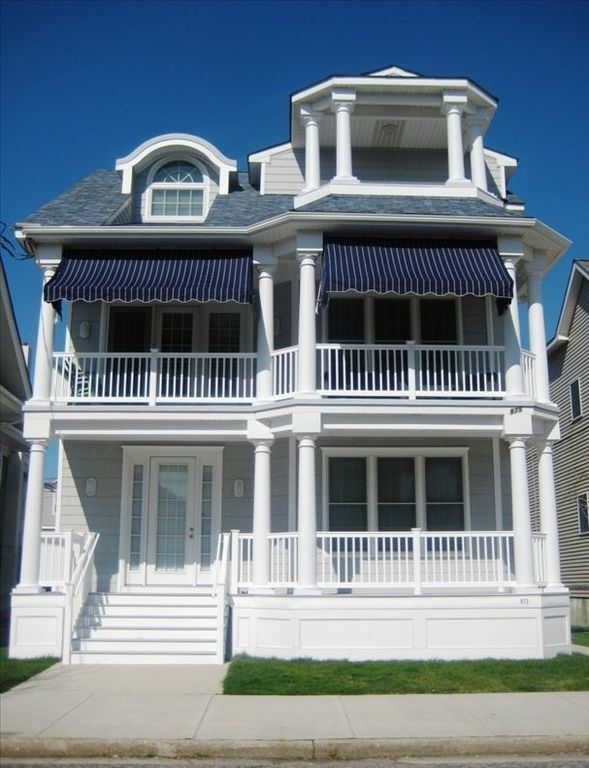 I highly recommend this house for its location near the beautiful beach in Ocean City, golf in Egg Harbor, restaurants and shopping in Cape May and Atlantic City. This was our second time staying at this house and it was just as awesome as last year. It was super clean and looks just like the pictures. The location is great for beach and boardwalk. There was plenty of room for all 12 of us to sleep comfortably and have our privacy too. Lots of decks with ocean breezes and wonderful views. The kitchen is large and spacious for large family gatherings. Elevator was great for my elderly mother and also to transport all our luggage and stuff. You guys have done a wonderful job making a vacation house feel like home. Looking forward to next season! Saturday to Saturday rentals only after Memorial day Property is available for rent in the off season as well. Please contact me for off season rates.